In September 2018 in the fourth BeTheFace campaign, TU Graz was looking for students from all the faculties to represent their university for one whole year online and offline. Numerous students from different countries of origin and fields of study applied. The jury was spoilt for choice and focused on authenticity, diversity and uniqueness. The seven faces who were chosen will have reason to be happy about the results of the professional photo shoots since they will also receive in recognition additional City of Graz vouchers and a TU Graz hoodie. The faces from the previous campaigns are almost everywhere: in TU Graz’s web presence, in the Intranet TU4U, in print publications such as the TU Graz Annual Report, the information folder, Facts & Figures, study brochures and even on trains and flags. Do you want to take part, too? At the end of September 2019 there will be another chance to be the face of TU Graz. 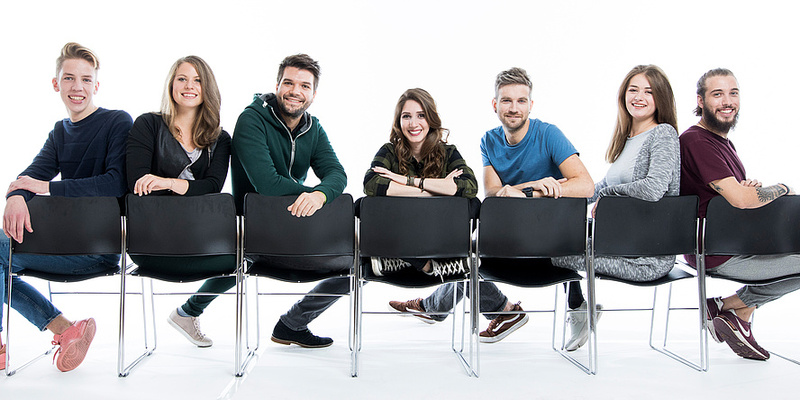 The first photo shoot featuring the winners was held in November 2018 – the setting, together with a professional photographer and make-up artist, invoked a studio atmosphere within the venerable walls of the University. Portrait photos and group pictures were taken. In the new year, too, joint photo shoots with the seven winners are on the programme. ... our faces represent TU Graz online and offline for one year? ... our faces take part in professional photo shoots? ... our faces will receive City of Graz vouchers and TU Graz promotional articles as a small thank-you? ... there will be another chance to be a face of TU Graz in autumn 2019? … because when I was a child, I reorganised my room using true-to-scale plans. ... because I find it fascinating shaping the environment and at the same time doing good things for people. ... because it’s extremely exciting being part of new technological developments right from the beginning. ... because I’m equally interested in technology and management. ... because that’s just the way it is was never enough for me. ... because chemistry is like a secret language for me, by which I can understand the world better. ... because, using my creativity, I can develop something which makes life easier for people.